Apollo 13 is a 1995 American space docudrama film directed by Ron Howard and starring Tom Hanks, Kevin Bacon, Bill Paxton, Gary Sinise, and Ed Harris. The screenplay by William Broyles, Jr., and Al Reinert dramatizes the aborted 1970 Apollo 13 lunar mission and is an adaptation of the book Lost Moon: The Perilous Voyage of Apollo 13 by astronaut Jim Lovell and Jeffrey Kluger. The film depicts astronauts Lovell, Jack Swigert, and Fred Haise aboard Apollo 13 for America’s third Moon landing mission. En route, an on-board explosion deprives their spacecraft of most of its oxygen supply and electric power, forcing NASA‘s flight controllers to abort the Moon landing, and turning the mission into a struggle to get the three men home safely. Howard went to great lengths to create a technically accurate movie, employing NASA‘s technical assistance in astronaut and flight controller training for his cast, and obtaining permission to film scenes aboard a reduced gravity aircraft for realistic depiction of the “weightlessness” experienced by the astronauts in space. 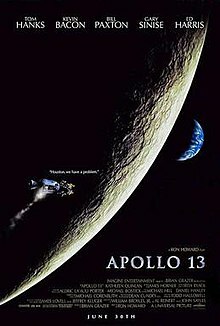 Released to cinemas in the United States on June 30, 1995, Apollo 13 was nominated for nine Academy Awards, including Best Picture (winning for Best Film Editing and Best Sound). In total, the film grossed over $355 million worldwide during its theatrical releases. The film was very positively received by critics. In July 1969, astronaut Jim Lovell hosts a house party where guests watch Neil Armstrong‘s televised first human steps on the Moon. Afterwards Lovell, who had orbited the Moon on Apollo 8, tells his wife Marilyn that he intends to return to the Moon to walk on its surface. Three months later, as Lovell conducts a VIP tour of NASA’s Vertical Assembly Building, his boss Deke Slayton informs him that because of problems with Alan Shepard‘s crew, his crew will fly Apollo 13 instead of 14. Lovell, Ken Mattingly, and Fred Haise train for their new mission. A few days before launch, Mattingly is exposed to the measles, and the flight surgeon demands his replacement with Mattingly’s backup, Jack Swigert. Lovell resists breaking up his team, but relents when Slayton threatens to bump his crew to a later mission. As the launch date approaches, Marilyn has a nightmare about her husband getting killed in space, but goes to the Kennedy Space Centerthe night before launch to see him off. On April 11, 1970, Flight Director Gene Kranz gives the go-ahead from Houston’s Mission Control Center for the Apollo 13 launch. As the Saturn V rocket climbs through the atmosphere, a second stage engine cuts off prematurely, but the craft reaches its Earth parking orbit. After the third stage fires to send Apollo 13 to the Moon, Swigert performs the maneuver to connect the Command/Service Module Odyssey to the Lunar Module Aquarius and pull it away from the spent rocket. Three days into the mission, the crew makes a television transmission, which the networks decline to broadcast live. After Swigert turns on the liquid oxygen tank stirring fans as requested, one of the tanks explodes, emptying its contents into space and sending the craft tumbling. The other tank is soon found to be leaking. They attempt to stop the leak by shutting off fuel cells #1 and #3, but to no avail. With the fuel cells closed, the Moon landing must be aborted, and Lovell and Haise must hurriedly power up Aquarius to use as a “lifeboat” for the return home, as Swigert shuts down Odyssey before its battery power runs out. In Houston, Kranz rallies his team to come up with a plan to bring the astronauts home safely, declaring “failure is not an option”. Controller John Aaron recruits Mattingly to help him invent a procedure to restart Odyssey for the landing on Earth. As Swigert and Haise watch the Moon pass beneath them, Lovell laments his lost chance of walking on its surface, then turns their attention to the business of getting home. With Aquarius running on minimal electrical power, the crew suffers freezing conditions, and Haise contracts a urinary infection and a fever. Swigert suspects Mission Control is withholding their inability to get them home; Haise angrily blames Swigert’s inexperience for the accident; and Lovell quickly squelches the argument. When carbon dioxide approaches dangerous levels, ground control must quickly invent a way to make the Command Module’s square filters work in the Lunar Module’s round receptacles. With the guidance systems on Aquarius shut down, the crew must make a difficult but vital course correction by manually igniting the Lunar Module’s engine. Mattingly and Aaron struggle to find a way to turn on the Command Module systems without drawing too much power, and finally transmit the procedure to Swigert, who restarts Odyssey by transferring extra power from Aquarius. When the crew jettisons the Service Module, they are surprised to see the extent of the damage. As they release Aquarius and re-enter the Earth’s atmosphere, no one is sure that Odyssey‘s heat shield is intact. The tense period of radio silence due to ionization blackout is longer than normal, but the astronauts report all is well and splash down in the Pacific Ocean. As helicopters bring the three men aboard the recovery ship USS Iwo Jima for a hero’s welcome, Lovell’s voice-over describes the subsequent investigation into the explosion, and the careers of Haise, Swigert, Mattingly, and Kranz. He wonders if and when mankind will return to the Moon. Tom Hanks as Apollo 13 Commander Jim Lovell: Jim Lovell stated that before his book Lost Moon was even written, the movie rights were being shopped to potential buyers and that his first reaction was that Kevin Costner would be a good choice to play him. However, by the time Howard acquired the director’s position, Costner’s name never came up in serious discussion, and Hanks had already been interested in doing a film based on Apollo 13. When Hanks’ representative informed him that a script was being passed around, he had the script sent to him. John Travolta was initially offered the role of Lovell, but declined. Gary Sinise as Apollo 13 prime Command Module Pilot Ken Mattingly: Sinise was invited by Howard to read for any of the characters, and chose Mattingly. Ed Harris as White Team Flight Director Gene Kranz: Harris described the film as “cramming for a final exam.” Harris described Gene Kranz as “corny and like a dinosaur”, but respected by the crew. Apollo 13 would be Harris’ second space travel-themed movie; he had starred as pioneering astronaut John Glenn in 1983’s The Right Stuff. The real Jim Lovell appears as captain of the recovery ship USS Iwo Jima; Howard had intended to make him an admiral, but Lovell himself, having retired as a captain, chose to appear in his actual rank. Horror film director Roger Corman, a mentor of Howard, appears as a congressman being given a VIP tour by Lovell of the Vehicle Assembly Building, as it had become something of a tradition for Corman to make a cameo appearance in his protégés’ films. The real Marilyn Lovell appeared among the spectators during the launch sequence. CBS News anchor Walter Cronkite appears in archive news footage and can be heard in newly recorded announcements, some of which he edited himself to sound more authentic. Rance Howard (his father) appears as the Lovell family minister. Jean Speegle Howard (his mother) appears as Lovell’s mother Blanch. Cheryl Howard (his wife) and Bryce Dallas Howard (his daughter) appear as uncredited background performers in the scene where the astronauts wave goodbye to their families. Brad Pitt was offered a role in the film, but turned it down to star in Se7en. Reportedly, the real Pete Conrad expressed interest in appearing in the film. Jeffrey Kluger appears as a television reporter. The screenplay by William Broyles, Jr. and Al Reinert was rewritten by John Sayles after Hanks had been cast and construction of the spacecraft sets had begun. While planning the film, director Ron Howard decided that every shot of the film would be original and that no mission footage would be used. The spacecraft interiors were constructed by the Kansas Cosmosphere and Space Center‘s Space Works, which also restored the Apollo 13 Command Module. Two individual Lunar Modules and two Command Modules were constructed for filming. While each was a replica, composed of some of the original Apollo materials, they were built so that different sections were removable, which enabled filming to take place inside the capsules. Space Works also built modified Command and Lunar Modules for filming inside a Boeing KC-135 reduced-gravity aircraft, and the pressure suits worn by the actors, which are exact reproductions of those worn by the Apollo astronauts, right down to the detail of being airtight. When the actors put the suits on with their helmets locked in place, air was pumped into the suits to cool them down and allow them to breathe, exactly as in launch preparations for the real Apollo missions. The real Mission Control Center consisted of two control rooms located on the second and third floors of Building 30 at the Johnson Space Center in Houston, Texas. NASA offered the use of the control room for filming, but Howard declined, opting instead to make his own replica from scratch. Production designer Michael Corenblith and set decorator Merideth Boswell were in charge of the construction of the Mission Control set at Universal Studios. The set was equipped with giant rear-screen projection capabilities and a complex set of computers with individual video feeds to all the flight controller stations. The actors playing the flight controllers were able to communicate with each other on a private audio loop. The Mission Control room built for the film was on the ground floor. One NASA employee, who was a consultant for the film, said that the set was so realistic that he would leave at the end of the day and look for the elevator before remembering he was not in Mission Control. By the time the film was made, the USS Iwo Jima had been scrapped, so her sister ship, the USS New Orleans, was used as the recovery ship instead. For actors, being able to actually shoot in zero gravity as opposed to being in incredibly painful and uncomfortable harnesses for special effects shots was all the difference between what would have been a horrible moviemaking experience as opposed to the completely glorious one that it actually was. Howard anticipated difficulty in portraying weightlessness in a realistic manner. He discussed this with Steven Spielberg, who suggested using a KC-135 airplane, which can be flown in such a way as to create about 23 seconds of weightlessness, a method NASA has always used to train its astronauts for space flight. Howard obtained NASA’s permission and assistance in filming in the realistic conditions aboard multiple KC-135 flights. In Los Angeles, Ed Harris and all the actors portraying flight controllers enrolled in a Flight Controller School led by Gerry Griffin, an Apollo 13 flight director, and flight controller Jerry Bostick. The actors studied audiotapes from the mission, reviewed hundreds of pages of NASA transcripts, and attended a crash course in physics. Astronaut Dave Scott was impressed with their efforts, stating that each actor was determined to make every scene technically correct, word for word. The score to Apollo 13 was composed and conducted by James Horner. The soundtrack was released in 1995 by MCA Records and has seven tracks of score, eight period songs used in the film, and seven tracks of dialogue by the actors at a running time of nearly seventy-eight minutes. The music also features solos by vocalist Annie Lennoxand Tim Morrison on the trumpet. The score was a critical success and garnered Horner an Academy Award nomination for Best Original Score. All music composed by James Horner, except where noted. The film was released on June 30, 1995 in North America and on September 22, 1995 in the UK. In September 2002 the film was re-released in IMAX. It was the first film to be digitally remastered using IMAX DMR technology. The film was a box-office success, bringing in $355,237,933 worldwide. The film’s widest release was 2,347 theaters. The film’s opening weekend and the following two weeks placed it at #1 with a US gross of $25,353,380, which made up 14.7% of the total US gross. Review aggregator Rotten Tomatoes reports that the film has an overall approval rating of 95%, based on 85 reviews, with a weighted average rating of 8.2/10. The site’s critical consensus reads, “In recreating the troubled space mission, Apollo 13 pulls no punches: it’s a masterfully told drama from director Ron Howard, bolstered by an ensemble of solid performances.” Metacritic, which assigns a normalized rating to reviews from mainstream critics, gave the film an average score of 77 out of 100, based on 22 critics, indicating “generally favorable reviews”. Ron Howard stated that, after the first test preview of the film, one of the comment cards indicated “total disdain”; the audience member had written that it was a “typical Hollywood” ending and that the crew would never have survived. Marilyn Lovell praised Quinlan’s portrayal of her, stating she felt she could feel what Quinlan’s character was going through, and remembered how she felt in her mind. A 10th-anniversary DVD of the film was released in 2005; it included both the theatrical version and the IMAX version, along with several extras. The IMAX version has a 1.66:1 aspect ratio. In 2006, Apollo 13 was released on HD DVD and on April 13, 2010 it was released on Blu-ray disc as the 15th-anniversary edition on the 40th anniversary of the Apollo 13 accident. The Film was released on 4K UHD Blu-Ray on October 17, 2017. The film depicts the crew hearing a bang quickly after Swigert followed directions from mission control to stir the oxygen and hydrogen tanks. In reality, the crew heard the bang 93 seconds later. The film portrays the Saturn V launch vehicle being rolled out to the launch pad two days before launch. In reality, the launch vehicle was rolled out on the mobile launch platformusing the crawler-transporter weeks before the launch date. One other incorrect dialogue is after the re-entry blackout. In the movie, Tom Hanks (as Lovell) says “Hello Houston… this is Odyssey… it’s good to see you again.” In the actual re-entry, the Command Module’s transmission was finally acquired by a Sikorsky SH-3D Sea King recovery aircraft which then relayed communications to Mission Control. CAPCOM and fellow astronaut Joe Kerwin (not Mattingly, who serves as CAPCOM in this scene in the movie) then made a call to the spacecraft “Odyssey, Houston standing by. Over.” Jack Swigert, not Lovell, replied “Okay, Joe,” and unlike in the movie, this was well before the parachutes deployed; the celebrations depicted at Mission Control were triggered by visual confirmation of their deployment. As far as the expression “Failure is not an option,” you are correct that Kranz never used that term. In preparation for the movie, the script writers, Al Reinart and Bill Broyles, came down to Clear Lake to interview me on “What are the people in Mission Control really like?” One of their questions was “Weren’t there times when everybody, or at least a few people, just panicked?” My answer was “No, when bad things happened, we just calmly laid out all the options, and failure was not one of them. We never panicked, and we never gave up on finding a solution.” I immediately sensed that Bill Broyles wanted to leave and assumed that he was bored with the interview. Only months later did I learn that when they got in their car to leave, he started screaming, “That’s it! That’s the tag line for the whole movie, Failure is not an option. Now we just have to figure out who to have say it.” Of course, they gave it to the Kranz character, and the rest is history. If there was a hero, Glynn Lunney was, by himself, a hero, because when he walked in the room, I guarantee you, nobody knew what the hell was going on. Glynn walked in, took over this mess, and he just brought calm to the situation. I’ve never seen such an extraordinary example of leadership in my entire career. Absolutely magnificent. No general or admiral in wartime could ever be more magnificent than Glynn was that night. He and he alone brought all of the scared people together. And you’ve got to remember that the flight controllers in those days were—they were kids in their thirties. They were good, but very few of them had ever run into these kinds of choices in life, and they weren’t used to that. All of a sudden, their confidence had been shaken. They were faced with things that they didn’t understand, and Glynn walked in there, and he just kind of took charge. We were working and watching the controls during that time. Because we came in shallow, it took us longer coming through the atmosphere where we had ionization. And the other thing was that we were just slow in answering. In the film, Mattingly plays a key role in solving a power consumption problem that Apollo 13 was faced with as it approached re-entry. Lovell points out in his commentary that Mattingly was a composite of several astronauts and engineers—including Charles Duke (whose rubella led to Mattingly’s grounding)—all of whom played a role in solving that problem. When Jack Swigert is getting ready to dock with the LM, a concerned NASA technician says: “If Swigert can’t dock this thing, we don’t have a mission.” Lovell and Haise also seem worried. In his DVD commentary, the real Jim Lovell says that if Swigert had been unable to dock with the LM, he or Haise could have done it. He also says that Swigert was a well-trained Command Module Pilot and that no one was really worried about whether he was up to the job, but he admitted that it made a nice subplot for the film. What the astronauts were really worried about, Lovell says, was the expected rendezvous between the Lunar Module and the Command Module after Lovell and Haise left the surface of the Moon. A scene set the night before the launch, showing the astronauts’ family members saying their goodbyes while separated by a road, to reduce the possibility of any last-minute transmission of disease, depicted a tradition not begun until the Space Shuttle program. The film depicts Marilyn Lovell dropping her wedding ring down a shower drain. According to Jim Lovell, this did occur, but the drain trap caught the ring and his wife was able to retrieve it. Lovell has also confirmed that the scene in which his wife had a nightmare about him being “sucked through an open door of a spacecraft into outer space” also occurred, though he believes the nightmare was prompted by her seeing a scene in Marooned, a 1969 film they saw three months before Apollo 13 launched. Jump up^ “CNN Showbiz News: Apollo 13”. CNN. Retrieved 9 April 2009. ^ Jump up to:a b c d e f g h i “Apollo 13 (1995)”. Box Office Mojo. Retrieved April 9,2009. Jump up^ “Apollo 13”. Box Office Mojo. 30 June 1995. Retrieved 11 September 2016. ^ Jump up to:a b “Academy Awards, USA: 1996”. awardsdatabase.oscars.org. Archived from the original on July 23, 2008. Retrieved 8 April 2009. ^ Jump up to:a b c d e f g “Lost Moon: The Triumph of Apollo 13”. Retrieved 1 January 2012. ^ Jump up to:a b c d e f g h i j Apollo 13: 2-Disc Anniversary Edition (Disc 1), Special Features: Commentary track by Jim and Marilyn Lovell (DVD). Universal Studios. 19 April 2005. Jump up^ “Film Casting that Might Have Been for John Travolta and Richard Gere”. Archived from the original on July 28, 2014. Retrieved January 1, 2012. Jump up^ The character in the film is a composite of protocol officer Bob McMurrey, who relayed the request for permission to erect a TV tower to Marilyn Lovell, and an unnamed OPA staffer who made the request on the phone, to whom she personally denied it as Quinlan did to “Henry” in the film. “Henry” is also seen performing other OPA functions, such as conducting a press conference. Kluger, Jeffrey; Jim Lovell (July 1995). Lost Moon: The Perilous Voyage of Apollo 13 (First Pocket Books printing ed.). New York: Pocket Books. pp. 118, 209–210, 387. ISBN 0-671-53464-5. Jump up^ “Repertoire Of Horrors: The Films Of Roger Corman”. Retrieved 1 January 2012. ^ Jump up to:a b c Apollo 13: 2-Disc Anniversary Edition (Disc 1), Special Features: Commentary track by Ron Howard (DVD). Universal Studios. 19 April 2005. Jump up^ “Brad Pitt – A Quick Overview”. Retrieved 1 January 2012. Jump up^ Johnson, Mary; Neff, Renfreu; Mercurio, Jim; Goldsmith, David F. (April 15, 2016). “John Sayles on Screenwriting”. Creative Screenwriting. Retrieved 2 October 2017. ^ Jump up to:a b c d e Apollo 13: 2-Disc Anniversary Edition (Disc 1), Production Notes (DVD). Universal Studios. 19 March 2005. ^ Jump up to:a b c d “Production Notes (Press Release)” (PDF). IMAX. Archived from the original (PDF) on June 4, 2011. Retrieved April 9, 2009. Jump up^ “Ron Howard Weightless Again Over Apollo 13’s DGA Win”. Retrieved 16 December 2011. Jump up^ Soundtrack.Net review Archived June 5, 2008, at the Wayback Machine. Jump up^ Tracksounds review Archived April 1, 2009, at the Wayback Machine. Jump up^ Apollo 13 soundtrack review at Filmtracks. Retrieved 24 February 2011. Jump up^ “History of IMAX”. Retrieved February 11, 2011. Jump up^ “Apollo 13”. Rotten Tomatoes. Archived from the original on August 20, 2010. Retrieved August 24, 2010. Jump up^ “Apollo 13 Reviews”. Metacritic. Retrieved September 25, 2011. Jump up^ “Apollo 13: Roger Ebert”. Chicago Sun-Times. June 30, 1995. Retrieved April 11, 2009. Jump up^ “Apollo 13: Review”. Time. July 3, 1995. Retrieved April 11, 2009. Jump up^ Guthmann, Edward (June 30, 1995). “Apollo 13 Review: Story heroic, but it just doesn’t fly”. San Francisco Chronicle. Retrieved April 11,2009. Jump up^ “Apollo 13 Review: Rolling Stone”. Rolling Stone. Retrieved April 11,2009. Jump up^ Maslin, Janet (June 30, 1995). “Apollo 13, a Movie for the Fourth of July”. The New York Times. Retrieved September 30, 2011. Jump up^ Malewitz, Raymond (September 5, 2014). “getting Rugged With Thing Theory”. Stanford UP. Retrieved September 30, 2014. Jump up^ Howard, Ron (December 8, 2008). “A conversation about the film “Frost/Nixon““. Charlie Rose. Archived from the original on December 11, 2008. Retrieved December 8, 2008. ^ Jump up to:a b c “Apollo 13 Blu-Ray Release”. Universal Studios. Retrieved September 29, 2011. Jump up^ “Apollo 13 (DVD – 2005)”. Lethbridge Public Library. Retrieved December 30, 2011. Jump up^ “Apollo 13 – 4K Ultra HD Blu-ray Ultra HD Review | High Def Digest”. ultrahd.highdefdigest.com. Retrieved 2017-12-22. Jump up^ “Symposium Awards”. National Space Symposium. Archived from the original on 3 February 2009. Retrieved 26 April 2009. ^ Jump up to:a b “AFI’s 100 years…100 quotes” (PDF). AFI. Archived (PDF)from the original on 26 March 2009. Retrieved 13 April 2009. Jump up^ The Real Story: Apollo 13, Season 4, Episode 3, 2012. See this section beginning at 15:18. Jump up^ “Page 231 of Apollo 13’s transcript at NASA Johnson Space Center” (PDF). Retrieved 8 August 2015. Jump up^ “Apollo 13’s re-entry transcript on Spacelog”. Jump up^ “Origin of Apollo 13 Quote: “Failure Is Not an Option.““. SPACEACTS.COM. Retrieved 4 April 2010. ^ Jump up to:a b c d William, Lena (19 July 1995). “In Space, No Room For Fear”. The New York Times. Retrieved 30 September 2011.